For a decade, the Global Water System Project (GWSP) has coordinated and supported a broad research agenda to study the complex global water system with its interactions between natural and human components and their feedback processes. This peer-reviewed book addresses the worldwide experiences on the responses of water management to global change within this last decade. 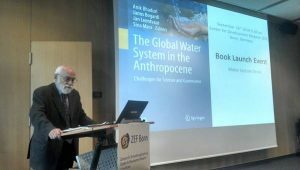 With selected contributions from the GWSP Conference “Water in the Anthropocene“ held in Bonn, Germany in May 2013, the book reflects the shift in mind-set that is required to address the water challenges of tomorrow, discussing issues like water governance and related institutional and technological innovations as well as variability in supply, increasing demands for water, environmental flows, and land use change. With 28 chapters, this edited volume embraces a wide variety of disciplinary and interdisciplinary perspectives that correspond to the four sections of the book, as outlined below. The papers under this theme present assessments of global water resource availability, deal with earth observations and the role of indicators, data and models of the global water system. They discuss aspects of how to account for water and uncertainties globally, covering both physical processes and socially mediated water fluxes, water withdrawals and uses as well as virtual water trade. The theme focuses on adapting to global changes at the river basin and regional scale. 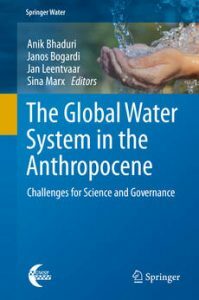 It includes contributions about adaptive resource management towards water security in river basins, papers addressing institutions and governance challenges in water scarce regions as well as papers bringing in historical perspectives to understand river systems in the Anthropocene. The third theme presents different approaches to ecologically sustainable water management drawing on various case studies. The section focuses on how to mitigate the negative impacts of anthropogenic activities on the resilience of social-ecological systems. The fourth section concentrates on the crosscutting issue of global water governance, acknowledging the fact that the global “water crisis” is in fact a governance crisis. Case studies in water governance and management under global change from different parts of the world are complemented by contributions dealing with issues like water law, ethics and institutions in water governance.